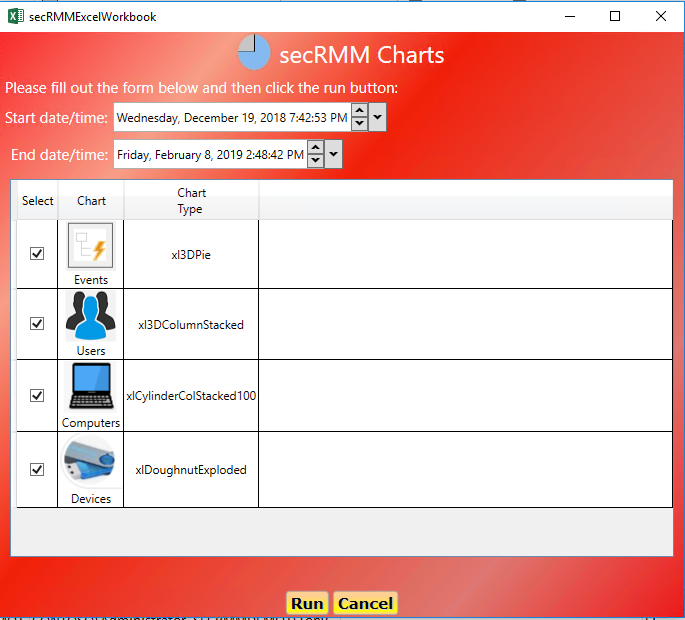 02/08/2019 – secRMM is Windows security software that records all the events related to USB storage devices. This includes thumb/flash drives, external hard drives, SD-Cards and mobile devices. With secRMM, you see the who, what, when, where and how about all the USB storage in your computer environment. secRMM comes with a utility to help you analyze the data in an easy way. The utility is called the secRMM Excel Add-In. As the name implies, it extends Excel. Microsoft offers Office Add-Ins for most of the programs in the Office suite. As you can see in the screenshot above, Excel has a tab in the ribbon bar named secRMM. The secRMM section contains various methods for you to pull the secRMM data into the Excel Worksheets. Once you have loaded the secRMM security data, you can use all the native Excel features (filtering, finds, macros, etc.). We have added a new feature into the secRMM Add-In. This is the “Charts” feature. While you can manipulate the data in any way you want to make your own Charts, we made an automated way for you to see the most common scenarios with just a couple of mouse clicks. Once you have some secRMM data loaded and you click the Charts button, you will be presented with a dialog (see below) that will let you specify the start/end times and the chart(s) you want to generate. 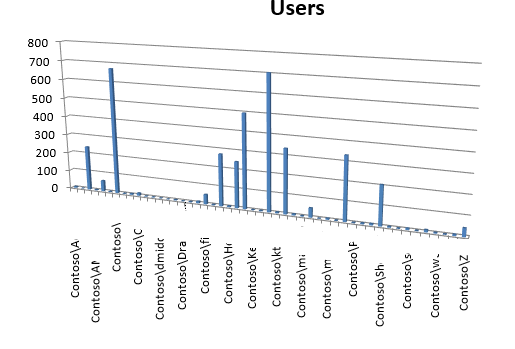 You can also specify what type of Excel chart to create for each chart. Microsoft offers many Excel chart types. The Excel chart type is totally up to you. Once you specify your time range, which charts and chart type, you will see the charts on the “Charts” worksheet (see below). 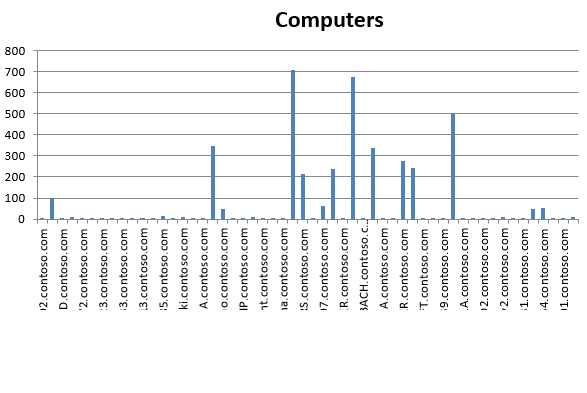 As you can see in the screenshots below (btw, the data at the axis has intentionally been chopped), you can easily see the: who (users), what (events), when (via time range), where (computer) and how (devices) of USB security activity occurring in your environment. 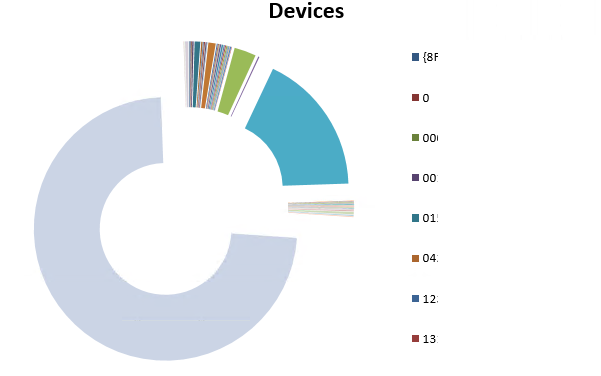 We hope the secRMM charts help you easily analyze your USB security data. Please let us know if you have any questions. You can reach us at support@squadratechnologies.com.